Craig, M.m.. "Alasua Amittuq Davidialuk". The Canadian Encyclopedia, 09 November 2016, Historica Canada. https://www.thecanadianencyclopedia.ca/en/article/alasua-amittuq-davidialuk. Accessed 18 April 2019. Inuit artist Davidialuk (copyright unknown). 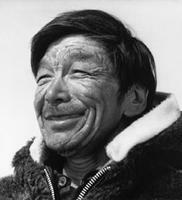 Alasua Amittuq Davidialuk, Inuk artist (b on a small island near Povungnituk, Qué c 1910; d on an emergency evacuation flight near Povungnituk 1 Aug 1976). An indifferent hunter, he lived in poverty until he gained recognition as a folk artist near mid-life. Only then could he afford the hunter's indispensable dog team (and later snowmobile). Davidialuk entranced his countrymen with spellbinding "true stories" - legends, myths and his own inventions. These he later translated into stone carvings, prints and drawings, now collected because of their ingenuous revelations of a cultural mystique. His last creative outpouring suggests an urgent need to articulate his personal view of Inuit history and morals.